This table lists recently employed Oklahoma workers who have no health insurance and who have family incomes at or below 100 percent of the federal poverty level. Most are not eligible for Medicaid or the new insurance premium tax credits that will take effect in 2014 under the Affordable Care Act. Based on the most recent U.S. Census Bureau data, the table includes only those working-age adults who reported being employed during the previous 12 months. 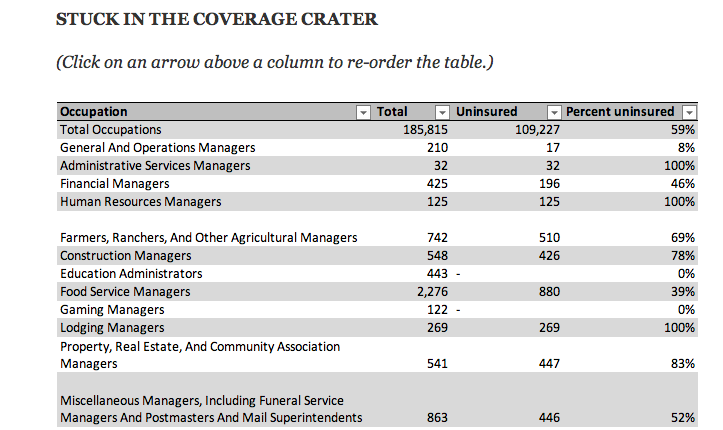 This table lists actively employed Oklahoma workers and their health insurance status, classified by industry group. It is limited to working-age adults who had been employed during the previous 12 months. An Oklahoma Watch analysis of federal data reveals which occupations have the highest number of workers in the state who will have no health insurance when the Affordable Care Act takes effect in January.